Fast-forward to 2019. That standoff is still in progress and has intensified in some ways… and we have another one brewing with China. The two conflicts differ, mainly due to China’s deeper trading relationship with the West. Trade frictions make that cold war economic as well as geopolitical. So it’s really double-trouble. A cold war is certainly better than a hot one. Despite all its industrial strength, most analysts think China is a long way from presenting a credible military challenge to the US. Our well-trained, technologically superior navy can easily handle China, we’re told. What if that assumption is wrong, though? Among other things, it would mean some of our macroeconomic assumptions are wrong too. So maybe we ought to question it. On June 17, 2017, the destroyer USS Fitzgerald collided with a civilian cargo ship just after leaving port in Yokosuka, Japan. Seven American sailors died and dozens more were injured. 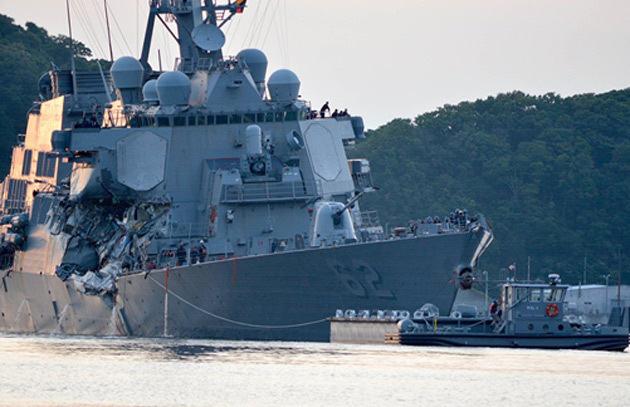 It was the US Navy’s worst accident at sea in decades. As if that hadn’t been awful enough, two months later it happened again. The USS John S. McCain crashed into an oil tanker near Singapore. Ten more sailors died. Both ships belonged to the storied 7th Fleet, our navy’s largest, most powerful, and arguably most critical battle force. It defends our allies in Asia and guarantees free navigation for the entire Pacific. And two of its high-tech ships, equipped with every imaginable defensive technology, were disabled by… unarmed civilian vessels. Official investigations blamed the two ships’ captains and crew, as well as the admiral commanding the 7th Fleet. Certainly they made serious mistakes. But a new, in-depth review by ProPublica says the blame goes much higher—and worse, very little is happening to fix it. ProPublica’s two-part series (Part I, Part II) is lengthy, dramatic reading. It recounts great heroism as sailors fought to save their ships and each other’s lives. It also shows the accidents happened because the Navy handed expensive technology to poorly trained, exhausted sailors and assumed everything would work perfectly. That part matches my own long-ago military experience. The Army would send us fancy new equipment we had no idea how to use or maintain. I don’t think this was just me. I’ve heard similar stories from veterans of all branches, going back to the Vietnam era and before. The 7th Fleet may have those same issues now. This is a problem, since we depend on it to keep global free trade humming. To be blunt, how is it even possible for a modern naval vessel to collide with a large, slow-moving cargo ship? They’re not hard to spot. I talked to someone who served on a similar destroyer in the 1980s. He found it baffling. In his day, in addition to sonar and radar, they had human lookouts posted on all sides of the ship. The lookouts were in constant communication with other sailors who plotted every nearby vessel’s location and course on a map. Collisions like these were inconceivable. According to ProPublica, at some point in recent years the human lookouts became optional. The Fitzgerald had none that night. It had a radar system that wasn’t working right while the only repair technician was away on medical leave. The sailors on duty did what they could. It wasn’t enough. The Pentagon and defense contractors say our forces have the latest and greatest technology. The fleet is ready to face any foe… except, apparently, those pesky container ships and oil tankers. In fact, we appear to have an expensively equipped Navy that skimps on people and training. That’s not so surprising if you think about it. New radar systems generate revenue for someone. Human lookouts don’t. Guess which one the government favors. We could talk about whose fault this is, and there’s plenty of blame to go around, but the result is the same. 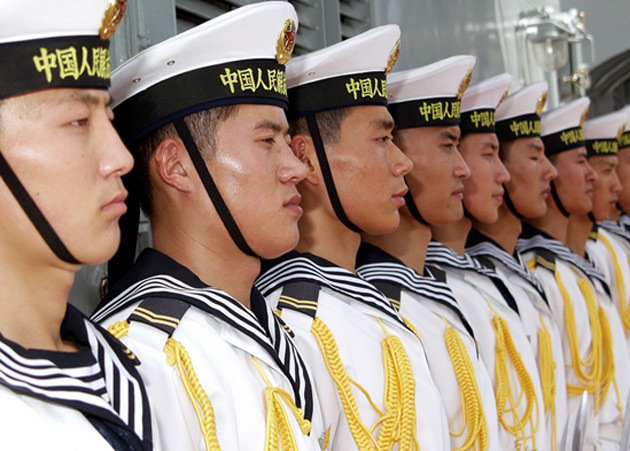 The assumption that the US has the military upper hand on China is just that—an assumption. No one really knows if it is true… and some of the signs aren’t good. Unburdened by such legacies, China is advancing quickly in key defense technologies like drones, quantum computing, and cyber warfare… some of which could render our destroyers and aircraft carriers irrelevant. Perceptions matter. Whether China is really superior is one question. 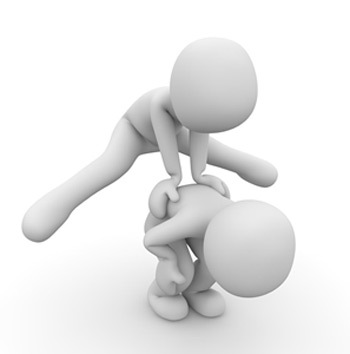 But if the Chinese government believes itself superior, it will behave differently in trade and other negotiations. The Fitzgerald and McCain incidents gave China good reason to suspect US power is hollow—and the US isn’t doing much to counter that perception. Throwing more money at defense contractors probably isn’t the solution. It may be part of the problem. Economic power depends on military power. This suggests the balance could change sooner and more profoundly than many of us think. That’s not a certainty, by any means. But it’s not impossible either. Unfortunately i see this in US Corporation too - it seems to be a new leadership mantra “ride the horses hard” and move to the next cushy job - there is no long term accountability for the top. If China is doing things differently here then we (or our kids) will face a harsh reckoning. There is an inherent balance between training and deployment, maintaining equipment and operating equipment. It takes some smart, talented leaders to not only understand that, but to take action when any one of the 4 areas get out of balance. Navy Fleet leadership (I’ve read both the analysis mentioned, and the actual report, as well as served in the 7th Fleet) has for a long time put operational deployment ahead of training, and maintaining. With a large fleet you can sometimes do that…there is some down time where you can catch up while at home port. Unfortunately, there is no large fleet now. Yet Navy leadership refused to say “No. We need to stand down to train, we need to put this ship in drydock”. Add to this “can do” attitude was a dire lack of training. Surface Warfare Officer School was reduced from a school house to “SWOS in a box”...a series of DVD’s that a young officer was supposed to watch in his/her off duty hours, then ask senior leadership questions on things they didn’t understand. Those young JO’s were facing a nearly impossible task…learn while doing, handle division officer responsibilities for their Sailors, stand a minimum of 8 rs a day of watch, do paperwork…all a typical 18-20 hour day, THEN you ask them to complete their DVD’s on their “down” time and get sign offs for getting their ship driving qualifications. Then you have them take over jobs where the previous officer has already left, or perhaps is on his/her way off the ship. Add in non-working equipment, or equipment that isn’t working right due to a lack of spare parts and repairs. Not mentioned but certainly a factor is a major lack of accountability by the Flag officer corps. Admirals are personally detailed into jobs by the Chief of Naval Operations. It isn’t always the person who is qualified for the job, but the guy the CNO likes, or wants to “groom” for further assignments. So, you end up with things like someone with no electronic warfare experience managing a computer warfare “Fleet.” That person knows how to lead, but knows even if he/she makes a bad decision, they will most likely be gone (either retired or moved to another job) by the time the effects are felt. That is how we end up with grossly overcost programs like the F-35 or ships that can’t fight like the LCS program, and unfortunately how we end up with an overworked, worn out 7th Fleet, because each new Commmander-In-Chief Pacific can “ride the horses hard” then move off to a cushy defense contracting board job, or move back to the Pentagon. The next CINCPAC comes in, full of fire to do a good job, and “rides the horses hard.” This goes on and on and on as each guy making operational decisions wants to promote, and each “knows” his Sailors can hack it. Until they can’t. As the report said, when he fired the Pac Fleet Commander, CINCPAC said “It is either you, or me.” Every Flag officer in the chain should have been cashiered. You can fix this broken Fleet, but it is going to take having the courage not to pull a ship out of maintenance for ANYTHING short of major war, requiring people to go to school on equipment, and putting adequate money into repair parts, not focusing solely on shipbuilding. (Who the heck cares if we forego one more LCS when the ships are not deployable to a war zone anyway?) The “sequester” is what led to this so the Congress owns a piece of this, as does the entire Flag corps. I fixed a broken a/c maintenance department one time, having been sent over specifically to do so. You can’t do it by just abusing your people. You have to set a pace people can handle, identify small victories (and celebrate those victories) ask for good ideas on how to operate smarter. You also have to set the example, not accepting sub-standard work, getting schools for people, and training them in their jobs. There were a lot of 20 hr days, some folks who had to requalify in their positions, people brought in from outside where we lacked talent, but within 18 months we won the maintenance squadron of the year award for the community. This is a tough nut to crack. 7th Fleet cannot just “quit” deploying, but what it needs to do is gap some deployments, challenge Commanders to ID their issues without fear of penalty, and get the Chief Petty Officer corps involved. It is the only way to resolve the issues. Patrick nice articl. this is a very important and overlooked issue about our military. I think the US underestimates china’s long term determination to control its near abroad and regain its historical place as the center of the world. It’s last 200 years have been a disgraceful anomaly which iT will do anything to reverse.